Older adults' falls take significant physical tolls in terms of injuries and fractures, but the emotional aftermath can be equally devastating. Millions of older adults reside independently in the community, maintaining high levels of wellness and function despite living with chronic illnesses. Older adults' functional independence, however, can easily be eroded following a stumble or fall to the ground. While falls are not a normal age-related change, their frequency increases with individuals' advancing age.1 For many the emotional aftermath can be devastating. In order to improve the lives of millions of older adults who fall or are at risk of falling, health care providers must convey to patients some important messages. First, falls can be prevented, depending on their underlying causes and associated person-level risk factors. Second, many falls are the result of multifactorial events, such as medication side effects, and can be identified and eliminated through early intervention by reviewing an older adult's past medical history, symptoms at the time of the fall, and medications. Third, independence in physical function can remain or be maintained when falls are properly managed using available aids and devices to maintain structural integrity when a patient is walking and transferring. Fourth, older adults can learn to adapt their health behavior(s) to minimize the likelihood of repeat fall events. 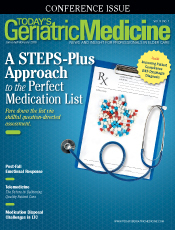 The Centers for Disease Control and Prevention (CDC) has cited falls in older adults as a growing public health issue. Every 14 seconds an older adult is transferred to an emergency department for a fall-related injury, and every 29 minutes an older adults dies from fall-related injuries in the United States. In 2012, more than 2.4 million older adults were treated in emergency departments for falls, and more than 772,000 were hospitalized as a result of fall-related injuries.2 Evidence shows that the most potent predictor for a fall is a history involving a previous fall.3 Detecting falls is critically important because evidence shows many of the multifactorial causes of falls can be addressed, preventing additional falls. Because of the burden of harm associated with falls and fall-related injuries, practice standards recommend that health providers inquire yearly on annual evaluations about each older adult's history of a fall to the ground. Some telltale signs are highly suggestive that a fall has occurred, even if a patient fails to report the event (see Sidebar 1). It is important to recognize that for one reason or another, an older adult may choose to conceal a fall or attribute a fall to old age and thus not report it. Every older adult has a unique story behind why, when, and where a fall occurs, just as each has a unique perspective about a fall's importance in his or her life. Sidebar 2 outlines the author's published 'four Ws' surrounding each fall occurrence and some common statements used to start a conversation with an older adult about what he or she recalls happening during and after a fall. It is very helpful to relay to him or her that you are attempting to obtain a mental image of the fall and then have him or her walk you through what happened. Repeating back what you heard will allow him or her to clarify or further elaborate on what transpired. Typically clinicians are inclined to inquire further to determine whether an older adult slipped, lost consciousness, or experienced a precipitating medical event. For some, falls do not enter their thoughts as being significant or serious. Older adults may be more concerned with other mounting health concerns or illnesses and self-rate their falling at the bottom of a long list of chronic ailments. Regardless of the reason(s) identified for reporting or failing to report a fall, vivid stories from personal experience of "serious" falls by healthy older adults living independently in the community portray significant emotional responses and aftermath of a fall. This should prompt health care providers to be concerned and investigate further; the author has been published on this subject.9 Some of the emotional responses experienced by older adults in the aftermath of a serious fall are presented in Sidebar 3. The following personal experiences of serious falls have exerted significant impacts in an older adult's life as they knew it. These falls were serious because of their influence on both emotional and functional well-being. Drawn from prior qualitative interviews designed to elicit the older adult's experiences, definition, and meaning of a "serious fall," below are a few vignettes. Nineteen older adults aged 67 to 98 who were living in the independent residence section of a continuing care retirement community (CCRC) in the northeastern United States and who had had at least one prior fall in the previous six months agreed to participate in one-on-one interviews with the researcher to discuss their most serious falls. The 19 participants were primarily women (n=17, 89.4%), with an average age of 83; less than one-half were married (n=8, 42%). Four individuals had fallen only once in the prior six months, and 15 individuals had fallen two or more time in the prior six months (range two to 24). These participants experienced a total of 66 falls, most of which occurred outdoors (n=14, 73.6%). Most experienced one or two "serious falls" (n=14; 73.6%) that did not involve a fracture-type injury. Only four participants (21%) reported fractures of the nose, rib, wrist, patella, or shoulder. Nearly all of the falls (n=18) occurred during a customary activity; only one participant had been engaging in a new activity at the time of the fall. • An 86-year-old widowed female spoke with frustration of her two noninjurious falls. The falls were serious because they were an intrusion that significantly inconvenienced her life and caused her to realize she had lost control, making her feel helpless. Unable to get around and do the things she liked to do, she reporting feeling dread, frustration, and anger, stating, "This is ridiculous, absolutely ridiculous; I felt like a kid calling, 'Mother help me (ha ha).'" At the age of 86, she feared her future would involve potential disability. Living as she did "among hundreds of them" [referring to other residents of the CCRC], a serious fall meant "aging." She stated, "If you fall, you may never get up again. Adults, after all, don't go around falling; it limits your activity. Now, at my age, it's perhaps the end of my walking or the end of a lot of my life." • An 88-year-old married woman who lived with her husband incurred two outdoor falls resulting in no injury. She recalled, "I thought, 'Why did this happen? Why did you have to spoil the trip?' I said to myself, 'There I go again,' then I slow down for a while. I see this as one more fall; now what's going to happen? I'm going to be disabled sooner. Falling means I have to make great adjustments, slow down … can't go to the garden anymore. It changes your relationships. I'm not pulling my weight in the relationship. My husband wants me to move faster ... I get frustrated by the fact that I can't move about as freely as in my former lifestyle." • Another participant said, "With the second fall, a buzz in my head, a notion that maybe there was something the matter with me. I don't go out as often and don't go anywhere alone. I won't cross the street without somebody with me. Sometimes it is a nuisance being independent." Older adults' accounts of their most serious falls reveal distressful emotional responses and functional limitations that impact daily living so much so that they resulted in the individuals developing concrete plans of action to avoid future falls at all costs. The range of emotional response from these participants included fear, concern regarding potential disability, anger, frustration, helplessness, hopelessness, and feeling "older." Providers need to understand older adults' perceptions and thoughts about falls and injury prevention if we are to reduce the incidence of falls and help older adults manage daily living despite the disruption a fall often brings. It is critical for health care professionals to uncover subjective reports during the postfall assessment period if we are to help older adults emotionally heal from the devastation a fall may have created. Helping patients develop effective strategies to manage daily living routines can result in a reduction of recurrent falls. Sidebar 4 identifies some of the more commonly used resources to help older adults manage falls in their homes. — Deanna Gray-Miceli, PhD, GNP-BC, FAANP, FAAN, is an assistant professor at Rutgers University School of Nursing and Institute for Health, Health Care Policy and Aging Research in New Brunswick, New Jersey. • Statements such as, "I'm afraid if I get up, I may not be the same." What: Tell me what happened. What do you recall about the fall and what you were feeling at the time of the fall? — Source: Gray-Miceli D. 5 Easy Steps to Prevent Falls: The Comprehensive Guide to Keeping Patients of All Ages Safe. Silver Spring, MD: American Nurses Association; 2014. Feeling: Older, helpless, hopeless, angry/frustrated, fearful of another fall. Fears: Relocation to another home, potential disability, incapacitation, dependency. Physical function changes: Inability to move/confined, pain with walking, bathing, breathing, combing hair, need to rearrange and replan activities in order to avoid falls. Social/role changes: Giving up grandparenting, inability to socialize, becoming dependent on children or spouse to maintain mobility. 1. Caffrey C. Potentially Preventable Emergency Department Visits by Nursing Home Residents: United States, 2004. NCHS Data Brief, No 33. Hyattsville, MD: National Center for Health Statistics; 2010. 2. Older adult falls. Centers for Disease Control and Prevention website. www.cdc.gov/homeandrecreationalsafety/falls. Updated September 21, 2015. 3. Kiely DK, Kiel DP, Burrows AB, Lipsitz LA. Identifying nursing home residents at risk for falling. J Am Geriatr Soc. 1998;46(5):551-555. _unintentional_injury_2011-a.pdf. Updated March 31, 2015. 5. Rapp K, Becker C, Lamb SE, Icks A, Klenk J. Hip fractures in institutionalized elderly people: incidence rates and excess mortality. J Bone Miner Res. 2008;23(11):1825-1831. 6. Rapp K, Cameron ID, Kurrle S, et al. Excess mortality after pelvic fractures in institutionalized older people. Osteoporosis Int. 2010;21(11):1835-1839. 7. National Center for Injury Prevention and Control, Centers for Disease Control and Prevention. Report to Congress on mild traumatic brain injury in the United States: steps to prevent a serious public health problem. http://www.cdc.gov/traumaticbraininjury/pdf/mtbireport-a.pdf. Published September 2003. 8. Faul M, Xu L, Wald MM. Coronado VG. Traumatic brain injury in the United States: emergency department visits, hospitalizations, and deaths, 2002–2006. Centers for Disease Control and Prevention website. http://www.cdc.gov/traumaticbraininjury/pdf/blue_book.pdf. Published March 2010. Accessed October 19, 2012. 9. Gray-Miceli D. Changed Life: A Phenomenological Study of the Meaning of Serious Falls to Older Adults [dissertation]. Chester, PA: Widener University School of Nursing; 2001. 10. National Falls Prevention Resource Center. National Council on Aging website. https://www.ncoa.org/center-for-healthy-aging/falls-resource-center/. Accessed January 2015.